Christmas season is really in full swing now and all I could think of is sponge cake. At home, my wife and mother are really cooking up a storm. Of course, I’m in the thick of it all, taking out the photos and doing up the posts and multitasking 101 things all at the same time. Since I last posted the black cake I decided to just put up as many of the recipes I have, just waiting to be posted. It will be a little tiresome but It will be done. As promised here is the sponge cake recipe ahead of time, but yuh know yuh boy have to talk a little bit about sponge cake. As a child growing up, sponge cake was just the usual cake you would get in your party bag (a brown paper bag) at a birthday party or class party. It would be mixed up with the popcorn and other sweets that were in the bag by the time you reached home but you didn’t mind and ate it anyway (Sponge cake and popcorn; what an interesting taste that was!) Sponge cake was just the Mr Regular of cakes for me; nothing extraordinary. Then everything changed when I met my then fiance and tasted her sponge cake. All I could say from then on was that all sponge cake were not created equal. Even the, run off the mill, box cake wasn’t tasting like hers. Her sponge cake had a milkiness that was just different and delicious. When she made at home there was never enough…Long story short, the recipe is here on the blog for everyone to enjoy and share with their families and friends. Cream sugar and butter until smooth. Beat the eggs. Add one at a time. 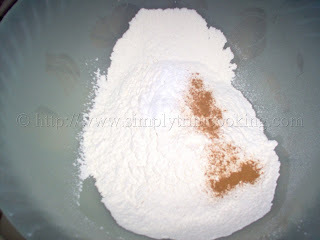 Fold in a 1/3 flour and a 1/3 liquid, repeat. Pour into greased pan and bake in a 350 degrees Fahrenheit oven until it leaves the sides of the pan. Alternatively, test with a thin knife; insert in the centre of the cake, if it comes out clean the cake is done. I have come to the end of another wonderful post. See you soon. Bye! Some people have a lot of trouble following the steps for this cake, so I have attached this note for those readers who might need additional information. This recipe is a basic sponge cake recipe. 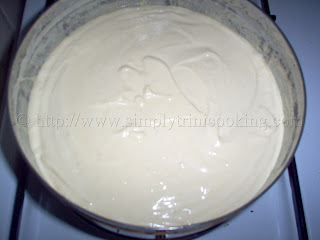 I believe if you prepare this cake according to the directions you should get a smooth, almost milky, spongy cake. Believe me, it does come out spongy, I’ve used this recipe many times and it has never failed. Everyone has different expectations and preferences for a sponge cake – some people like it VERY light, some like it looking very yellow, others like it white, some like it without much spice. That is the beauty of cake making, you can make any recipe very close to what you want it to be. You just have to know the mechanics of cake baking. There will have to be some adjustments in the recipe ingredients, but you can get a cake the way you want it.If you don’t like too much spices, don’t add it. If you want a more yellow cake, I usually make sure to use butter, not margarine, and if you have access to creole eggs (common fowl eggs), that will be better. Just remember, some creole eggs are smaller, so you might have to use additional eggs for your cake. Also, choose your cake pans carefully. 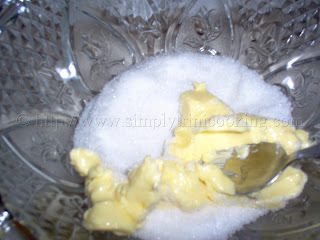 Also, make sure the sugar and butter is beaten until it its very light and fluffy. You can get a lighter batter by folding 1 to 2 tablespoon of warm water into the batter immediately before spooning it into the cake pan. In future, we will post more cake recipes for you to show the many different textures of cake and some guidelines in baking cakes. We thank you all for your encouraging comments. And for those who seem to be having trouble, we encourage you to always follow the directions and take care in how you prepare the cake. A good cake cannot be rushed. Nice recipe tried it and everyone loved it! Felix, won’t the lemon juice and milk curd. felix – that’s the point. this gives more tang and flavour to the recipe but if you want, use buttermilk instead (lemon juice + milk is a no-fail substitute for buttermilk). the acidity reacts with the baking powder and gives the recipe more lift. 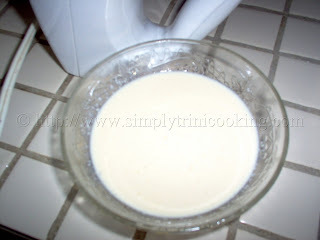 It didn’t but if you are worried about the milk curdling you can add it last before mixing. ok i will try it out! one more question Felix, what is the cause of a ‘line’ inside a cake? Hi Felix, this recipe calls for what size cake pan? A line? You will have to explain. Felix, I tried this recipe twice and for some strange reason the cake come out with a brown hue. All is well until I have to add the vanilla essence. I am using Ibrahim’s pure essence. Help please? Thanks. Brown you say??? What type of sugar did you use and how much of the essence did you use? If you use too much of the vanilla essence it could affect the colour and if it’s Ibrahim’s then maybe you should use less since it is pure. Hi what size cake is this? Hi felix, so im totally gonna try this, i actually dreamed about baking this cake, so ocd kicked in and its about to go down lol, wish me luck :*). Oh and can i put mixed essence an vanilla essence together in the cake?? This is where you leave comments. If you want help you state what it is or you can contact me using the contact page. Ok don’t bother anymore. I made the cake and it came out very good FELIXXX! when making my cake i usually blend my sugar , butter,essence, bitters and egg in the blender is that ok ? You say blender, do you mean mixer? Or, do you really use a blender? Felix, what’s with the cinnamon and nutmeg in this recipe?? Those spices totally corrupted the taste of the sponge cake….it was sweetbread cake. Felt Like I wasted my stick of butter….honestly I think u made a mistake with that. After 22 comments in two years you’re the first to have a problem with the recipe….That being said the solution to your problem is easy …just leave out the spices next time you make the cake or check your measurements carefully. Trinis born and grew up in Trinidad are very familiar with adding spices to everything, this is the norm. By the way are we speaking about the same thing when you use the term creole eggs. I was born and raised in Trinidad and never heard of creole eggs, now i am familiar with common fowl eggs, the yolks are extremely yellow. Looking at the picture of your sponge cake, yours seems to have the consistency I’ve been looking for. For the milk in the recipe, can I use the regular gallon milk at the supermarket, or should I mix some powdered milk like we do back home? Hi Felix, been looking for a good sponge cake recipe for over 15 years, Kept getting pound cake recipes and spongey cake outcomes. It really looked and felt like sponge. You may know the type. Anyway, this recipe sounds familiar to what my mom used to make back in Trinidad, and I’m super excited to try this with my daughter. Thanks a bunch. Thanks for the great recipe- made this for New Years and everyone liked it. Think it was the best sponge cake I ever made. Absolutely love your recipes – i follow them to the tee. This one came out more like a spice cake though – it was darker in color and the spices were a bit overwhelming. I’ll try it again, but will only use 1/4 tsp of nutmeg and cinnamon. I’ll re-post to let everyone know how that turns out. I tried it with only 1/4 tsp of nutmeg (not a big fan of cinnamon) and it was spot on. I made this cake for christmas and everyone including myself, enjoyed it! Very easy to make; thank you very much. Tried this recipe today. The wife and kids cannot stop talking about how great the cake came out (tasted). Thanks for posting this great recipe. First cake baked from scratch at our home. the measurements are exact and the taste great. Thank you Triniak47 for such a wonderful comment. I’ve been looking for a Sponge cake recipe for the longest time.Can’t wait to try it. I suspect that the “line” that gellybean david got may have come about because the eggs were separating from the batter. 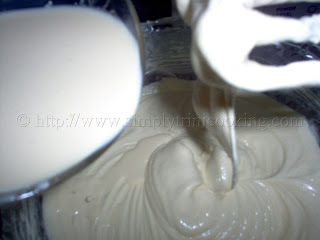 It’s recommended that once you mix a cake, it doesn’t have to be sponge, you should put it into the oven immediately. This means that you heat your oven to the right temperature before pouring your batter into the tin. Some people tend to pour and wait for the oven to achieve baking temperature, during that wait time the eggs start to separate from the batter. When the cake is baked one can then see a dense “line” through the cake. Hope this helps, gellybean david. The amount of butter varies due to brand so the best way to do this is to just buy the butter and measure it. Looks delicious, my question is : What standard of measuring cups and spoons did you use for this recipe? I live in the US so I use our meas. cups here, eg: Clear cup for liquids and a bit smaller cup for dry measure… Thanks. You can use the U.S measuring system. There shouldn’t be much of a difference. Now u can try making it urself! If I like a favourite recipe, u bet I will find a way to perfect it! I do not like butter or margarine. You can substitute it with coconut oil but a little less like 3/4 cup. The instructions will have to change though. You will have to melt the sugar, firtst. Pour it into the milk and leave it cool. Beat the yolk until they are light yellow and then Beat the egg whites separate until they form a peak. Mix together. 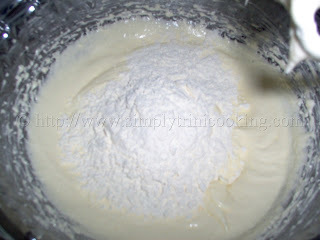 Then add the the rest of the liquid in thirds and alternating with the flour.Hope this helps and please give me some feedback, I’ll really like to know how it comes out. Tried this recipe as a quick Christmas eve sweet treat this year….it came out unbelievably good….so good that I have been requested to create it again for a family get together in a few days! I am not a baker by any stretch of the imagination…..lol….thanks for the great recipe! Great recipe thanks a million, so good made it twice in one week! Tried it once with a mixture of brown n white sugar was also great. For those wondering about butter: the regular one lb. of butter is 2 cups. If you use sticks it’s easier to measure. 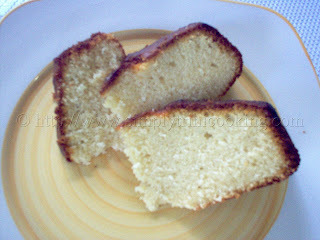 For Patruce: there is something called an oil cake, which produces the most delightful moist ‘sponge’ cake. Try googling it for the recipe. I do find it quite unusual to add the spices to the cake, although it is probably very nice. Reminds me of a spice cake recipe I have. The term ‘sponge’ cake is used differently in different countries. The term sponge in the U.K. refers to a butterless cake, called angel-food in the U.S. This recipe is called a butter sponge in some islands. It would be nice to know whether the creaming was done by hand with a wooden spoon, or by a mixer. The proportions of the recipe seem good. I will try it without the spices. Keep up the good work!!! One thing Mr. Felix…….how long do you have to mix the butter and sugar for??? I need help. For some reason my cake came out very heavy and with holes when you cut it. Please help. What did I do wrong? Hi, Gigi. There are three things you must remember when you are making sponge cake. 1. Make sure that all the ingredients are at room temperature before you begin. 2. It is best to bake cakes in the bottom third of the oven if you want it light and airy. 3. 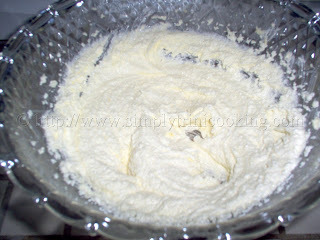 Sift the dry ingredients to aerate the flour. Hi Felix this is urgent. I would like to know how many pans of cake does this recipe make? I used this recipe today, my family enjoyed the final product immensely, thank you. Hi Felix! Thank you for another PERFECT recipe!!! Merry Christmas to you and your family and bright and PROSPEROUS New Year!!!! this recipe was awesome, it tasted great, the only thing my husband said it was a little dry… I thought it was fine, but cooking to please him, what can I do to add moisture to this cake? love this recipe. Have been using it throughout the year and using it today, Christmas 2015. This recipe was really lovely. Most delicious sponge and the spices made it exceptional. I received lots of compliments after making this cake for the first time. Thank you for sharing! I tried this recipe and the batter began to curdle once the lemon was added. Is it supposed to curdle or did I do something wrong? Never mind about the curdling. As soon as you see that happening, just add the flour. Curdling comes about sometimes if you over beat the batter. Great recipe, I tried it last week and everyone loved it I’m making another one right now ? It is indeed a great sponge cake recipe, so great that others have stolen it and put it on their site. Thank you for your comment Amanda. 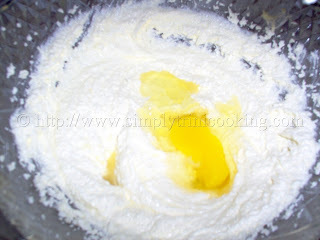 Hi Felix, Can you give some pointers or how long creaming the butter and sugar takes? this is my weak point. At our Caribbean room temperature it takes roughly 20 – 30 minutes. Hi there I am about to make this cake for the first time. Maybe I missed it but how long is the baking time (approx) for this cake? Because of the different cooking times of ovens I decided to use the method of testing explained. So after approximately 30 mins you could check with a knife or skewer.